Australian cabaret performer Trevor Ashley -currently wowing theatre critics in London- has his own pilot screening in a one-night only late timeslot on SBS 2 this week. After SBS asked for ideas for a new local entertainment show, Trevor Ashley (Hairspray The Musical) filmed a pilot of The Very Trevor Ashley Show, a modern comedy featuring a Filipino cleaner (Lena Cruz), a Muslim taxi driver (Nazeem Hussain) and a very white self-absorbed performer (Trevor Ashley). In a case of art imitating life, Ashley delivered a comedy pilot about fictional TV station ‘MBS’ commissioning a pilot for a comedy / entertainment show with no money, no guests and no idea. Ashley’s plan is to then impersonate guests such as Cher, Shirley Bassey, Susan Boyle and, in the pilot episode, Liza Minnelli (Ashley is currently performing Liza on an E on the West End). 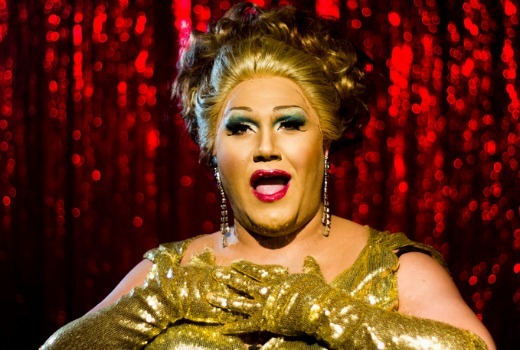 Also in the cast are Amanda Muggleton, George Houvardas, Maria Venuti (as herself) and Maggie Dence! • Comedy performer Nazeem Hussain had a real job as a tax lawyer. His Director character Naj doubles as a taxi driver. • Nazeem and George Houvardas (Packed To The Rafters) both still live at home with their family. • Actress Lena Cruz also worked as a cleaner as she tried to break into show business, like her character Carmen. • Trevor Ashley performed in retirement homes. • Trevor makes a career out of brilliantly portraying the world’s biggest female singing stars. • Trevor had a mini-meltdown on the set. • Maria Venuti asked if she could be a guest. This is created by Miriam Stein & Greg Logan from Hatch Entertainment, who recently won a global deal with Warner Bros by winning the International Pitch MIPTV Formats Competition in Cannes, written by Trevor Ashley & Phil Scott and directed by Erin White (At Home With Julia). This screens for one night only, and producers are hoping SBS will commission a full series from the pilot. Wednesday night at 11.25pm on SBS2. Set your PVR! that timeslot was chosen because at SBS they’d obviously seen it before airing & realised that this show is absolutely the pits..
worst script ever, bad acting. I think JimboJones sums it up best. Trevor Ashley’s mincing is unwatchable. His voice is utterly annoying. Really, really awful. The only good thing was that the show sent up the usual political correct BS that goes on at a place like SBS. in one word, its crap! 1 – It’s too long (50 mins). 2 – It’s mainly camp comedy, which as we know most Australians will not watch (eg. Outland). 3 – It’s going to run out of steam very quickly – can you really sustain an entire comedy series on a mincing drag artist doing Shirley Bassey impersonations on a fake TV show? On the plus side, some of the scenes were very funny indeed, especially the stuff in the pitch meeting (very true to life!). Lena Cruz and Nazeem Hussain were funnier than Trevor Ashley, which is a good thing – normally the star feels the need to be funnier than the supporting characters. This show would probably work better in the UK where there is a bigger theatre and cabaret scene. Three cheers to SBS for commissioning new and bold scripted comedy that doesn’t revolve around bogan humour. I’m looking forward to the other two pilots on tonight. Erin White is a star. David, do you know why SBS cose this awful time slot? SBS seems to be airing at least 3 pilots this week. The names on this one, the fact it is scripted, and that Ashley is riding in high in London, was enough for me to give it feature status. Erin White directing this is a big plus in my book. Extremely talented, as yet underrated Oz director. Her short films are also terrific.